Note: to prepare pipis, discard any that are chipped, broken, or damaged in any way. Tap to check that the shells are tightly closed, discarding any that remain open. Soak in salted water for 30 minutes to purge any remaining impurities. Remove the pipis and rinse in fresh water prior to cooking. Prepare your embers. Spread the embers evenly across the base of the grate and set a grill cooling rack 2.5 cm above the embers. Place the pipis directly on the rack. Immediately cover with a lid and allow to cook for 2–3 minutes, or until they open. Meanwhile, grill the garlic scapes and karkalla over the embers. Uncover the pipis and using a pair of tongs, carefully remove them as they pop open, placing them into a clean bowl and retaining as much of the liquid as possible. Add the lemon zest and juice to the bowl. In a small cast-iron pan, heat the olive oil. Add the chilli and gently fry until lightly golden. Pour the chilli oil over the pipis. Strain the mix of oil, lemon and pipi juice into a warm saucepan and whisk to emulsify. Add the parsley and mix well. 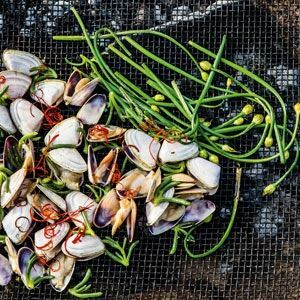 Arrange the pipis in a bowl and pour the emulsified juices over, garnish with the garlic scapes and karkalla, and serve immediately. Credits: This is an edited extract from Finding Fire by Lennox Hastie published by Hardie Grant Books RRP $60 and is available in stores nationally.